“Kiwami” means “extreme.” Or it could also mean “climax,” even possibly “remake”—I’m still not entirely sure. According to YAKUZA KIWAMI, it means “extreme,” so I’m probably going to defer judgement on that one. KIWAMI is a remake of the original YAKUZA game, released in the distant past of 2005 for PS2. Crossfader covered the game’s prequel, YAKUZA 0, earlier this year, which in retrospect seemed like a warm-up for the complete remastering of the original Yakuza story featuring Kazuma Kiryu’s expulsion and then rise through the ranks of the Tojo clan’s Dojima family. I’ve had limited experience with the Yakuza series prior to this game, by which I mean I was intrigued after watching a playthrough of YAKUZA 0, and was eager to dive headfirst into the series myself. In what will become a common theme throughout this review, whatever your experience was when playing YAKUZA 0, you’ll feel more or less the same while playing YAKUZA KIWAMI. Many of the gameplay systems are similar, most notably the reimagined combat. KIWAMI bills itself as an action brawler, and the fighting feels satisfying and fairly sharp. The four combat styles of Rush, Beast, Brawler, and Dragon make a return, but in order to buff them up, the player has to navigate upgrade systems that are largely similar to the ones from 0, with the exception that they don’t rely on money this time around, but standard experience points. If any aspect of YAKUZA has aged less than gracefully, it’s the user interface. The menus tied to Kiryu’s skills are a little unintuitive and at times confusing to navigate, which makes strategically planning your upgrade path unnecessarily difficult. 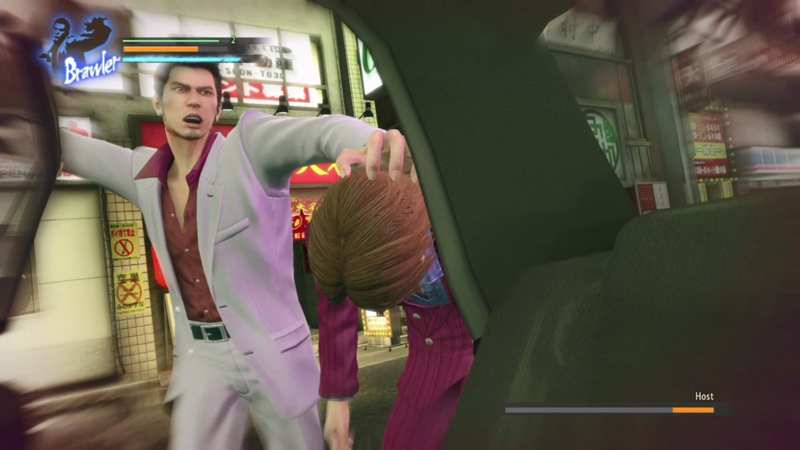 An example of how the clunky presentation can lead to unexpected hang-ups: in addition to introducing the player to Heat Moves, which are special combat actions usable after hitting enough dudes in the face, the game also explains Kiwami Heat Moves as special actions when a particularly powerful enemy is taking a breather, and that they should be used before they can heal themselves. The first time I encountered an enemy doing this I was all pumped and primed to unleash the fury of Kiryu’s fists, but the appropriate prompt never presented itself. After a several instances of powerful enemies healing themselves and me being powerless to stop them, I had to consult the internet and figure out what was wrong. Turns out I had to unlock those abilities on the upgrade wheel before I could use them, but the game felt that that wasn’t pertinent information for the player to know. The game also introduces the Majima Everywhere system in order to level up your legendary combat style, Dragon. 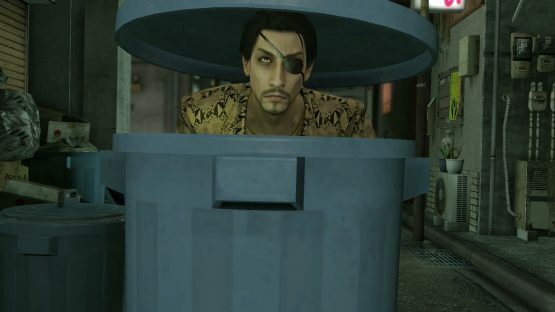 In brief, “Majima” is Goro Majima, a fellow Yakuza from a different family who has a history with your character that wasn’t exactly explained in YAKUZA 0, but basically, he’s supposed to be psychotic, and in order to get you back to where you were physically before you went to prison, he’s committed to ambushing you randomly on the streets of Kamurocho. Every fight boosts the Majima Everywhere gauge and allows you to unlock more and more moves for your Dragon style. The system can provide a solid source of anxiety, as Majima is much more difficult to defeat than the roving bands of thugs that constantly try to pick fights with you, and if you’re caught without health items during one of his traps, your reward is only a slight uptick on the gauge. Fortunately these are minor nitpicks, and as I mentioned previously, the combat is incredibly satisfying, especially the Heat Moves. These ultimate attacks are pretty brutal, almost to the point of camp, and KIWAMI manages to keep fighting from getting too stale by introducing more and more of these over time. While piledriving some random thug headfirst into the asphalt can get old after a bit, there’s a sort of sadistic thrill in discovering a takedown wherein your opponent is beaten with a teapot full of scalding hot water, then while they’re on the ground the water is poured all over them. As with YAKUZA 0, while KIWAMI generally advertises itself as a brawler, there is just so MUCH more game beneath the surface: substories, minigames, minigames with their own substories, everything that can distract a player from the main story is present in YAKUZA KIWAMI. 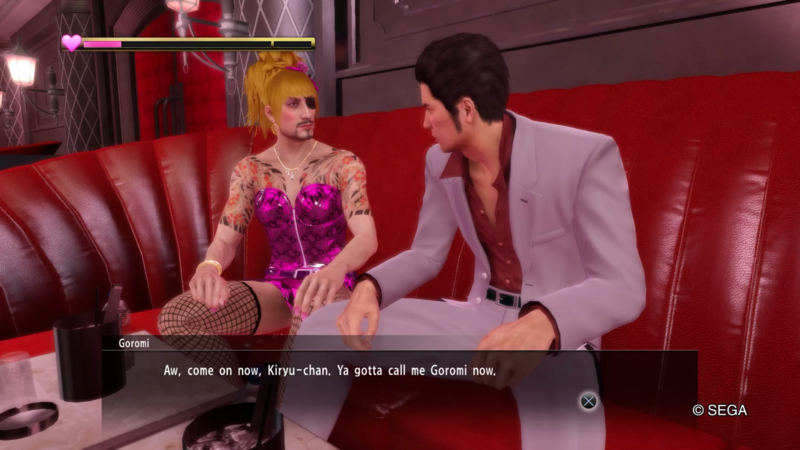 Each facet could come with their own mini-review, whether it’s a critique of the slot car Pocket Circuit games, a dissection of why the titillating MesuKing card game is marketed toward children, or the ethics of romancing two different cabaret girls at the same time—any way you slice it, YAKUZA KIWAMI is a menagerie of experience in one glitzy package. The main plot eventually becomes somewhat of a sideshow, a framework to explain just why the protagonist spends most of his time trying to beat children at a card game and beating adult men into the pavement. To be honest, it’s nothing amazingly groundbreaking: disgraced Yakuza Kazuma Kiryu has been recently released from prison after serving 10 years for allegedly murdering the patriarch of the Dojima crime family, his own leader. Labelled as a traitor and a murderer despite taking the fall for his foster brother Akira Nishikiyama, Kiryu must find out the connections between the sudden disappearance of his childhood friend Yumi and her sister Mizuki, the appearance of Mizuki’s daughter Haruka, and a grand conspiracy involving the Tojo clan itself. What I’m getting at is that it’s basically a soap opera with more punches than usual. However, I do appreciate the story for recapturing the lost art of explaining why your character starts with all of their abilities and then suddenly has none of them; spend 10 years in Japanese prison and you’ll probably lose a few skills too. And gain a few while you’re at it! While I’ve often thought of and presented myself as someone who values the narrative in a game more than anything else, what draws me to the Yakuza series is, yes, the satisfying combat, but also the absolute absurdity that permeates most of the game—the cutscenes are dramatic and tense affairs where people are killed, betrayed, and horribly wounded. But the player can immediately go from those to defeating an alleyway full of thugs by picking up an entire motorcycle and swinging it around. 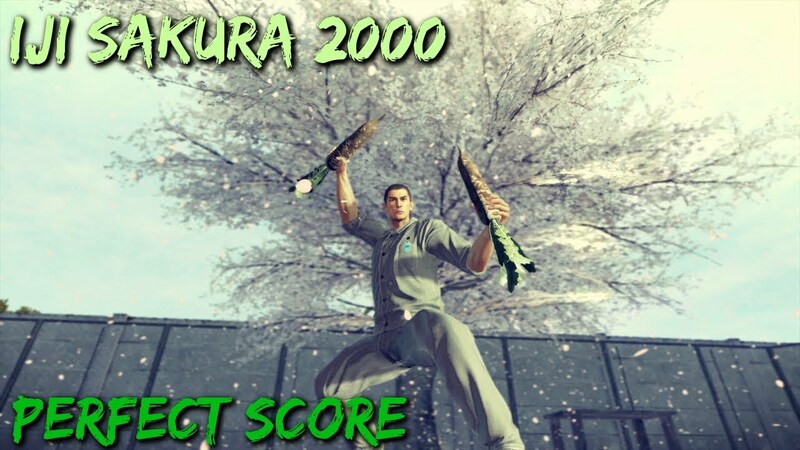 Kiryu can stab enemies and break their legs, yet those aren’t necessarily one-hit moves. A gunshot will bring a character to the brink of death in one scene, but in combat, you can shoot your psychotic rival 10 times and still only take down half a bar of health. A lot of the fun of playing KIWAMI is just seeing what the game throws at you next in terms of substory or mission, or even minigame or cutscene. I was particularly thrown off after I had fully strengthened my relationship with one of the cabaret girls in the game—as a result, the game, without warning, cuts to a fully live-action video of a Japanese model cavorting about in bedsheets. It’s a little nuts. As one would hope on a modern remaster of a game from the mid-2000s, the graphics are stellar, especially during the cutscenes. Sega seems to have allocated most of that budget into rendering every single pore on the cross concrete slab that happens to be Kiryu’s forehead. However, this occasionally translates to hiccups when you’re running around the game world, as trees will sort of pop up out of nowhere and people will fade in and out of existence. It can be a little distracting, especially with the quality of cutscenes, but I think there’s an unwritten law, especially with Japanese games, that the cutscenes are supposed to be brilliantly animated and leaps and bounds ahead of the gameplay animation. Also, I gotta say, the soundtrack is full of absolute bangers. Drawing heavily on metal influences for all of the fight sequences, KIWAMI sure knows how to give music to beat people up to, even if sometimes the music itself starts to edge on camp. I can’t offer any meaningful critiques of how the game fares as a remake, only that I’m very glad that they eventually decided to do away with the English voice actors altogether. Maybe it’s a simple subs v. dubs thing, but the game just feels better in the original Japanese. If you’re not stymied by randomly-activated objectives and endless side quests, YAKUZA KIWAMI offers an (almost literally) endless stream of entertainment as you master darts, bowling, slamming car doors on the heads of thugs, and surprisingly not that much crime. If you incidentally happen to be really into beating up thugs and smashing their faces into walls, you’ll enjoy YAKUZA KIWAMI even more, but you should also seek help. Maybe take some breathing exercises.